Hello all, honestly I meant to post this yesterday to talk about my awesome weekend but I was beat. Life has been pretty busy. I start back in school this week and already there is drama. One of my required classes for degree completion is right in the middle of the day. I tired to find a way to work around the time but unfortunately, that isn't going to work. Now I have an inquiry to see if an independent study could work to replace the class requirement. Keep your fingers crossed. 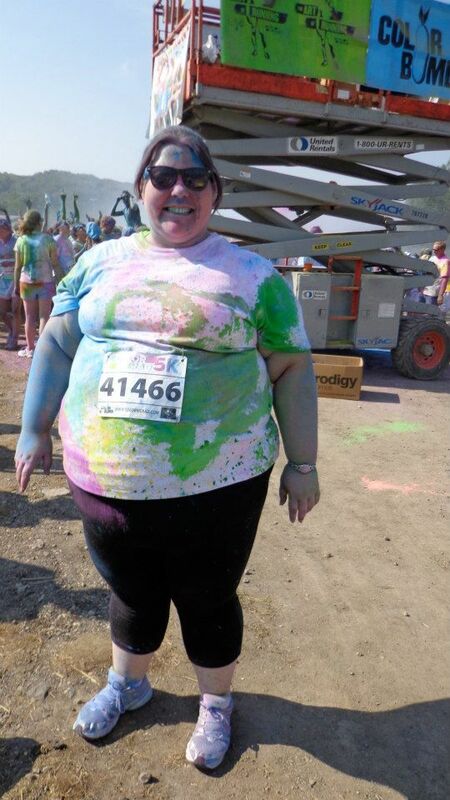 Anyway, this weekend I participated in the Color Me Rad 5K. It wrapped around a part of the county fair grounds. Now if your not familiar with the topography of Southwestern PA, it's quite hilly here due to the lowland from the Allegheny mountains and ravines from the rivers. It makes for a lush green and rolling hill local but you can't escape the hills and these three miles were pretty hilly. Needless to say, my behind was sore the rest of the weekend because have of the 5k was all uphill. Granted the second half was back down hill but it was still brutal. So why was this so great, because I felt like a kid again. The whole point of the 5K, (aside from raising money for Ronald McDonald House Charities) was to get coated in dyed corn starch. Don't I look beautiful! I had a blast even though my toes and arm are still blue. I felt like a hand dyed skein of yarn and even I made sure to soak my shirt in vinegar to set the colors. Given the hill climb, there were plenty of times that I wanted to quit but I just kept walking because I wanted to be covered with the next color. So that was my weekend. How was yours? Was it as colorful?